I always encourage players, particularly newer players, to learn to get comfortable shooting with the opposite hand. There are shots that come up pretty frequently that are really difficult to reach and play effectively with your dominant hand. Some players don�t like using a mechanical bridge because of the tendency to miscue. When you first start to practice shooting with the opposite hand, always check yourself in a mirror to see if your stroke is straight. The tendency with people shooting with the opposite hand is their back elbow ends up way away from their side. You need to make sure your mechanics are the same as with your shot on your dominant side. Once you get comfortable with a straight stroke, shooting with your opposite hand can be a great value. I only use an opposite hand shot if the ball is near or in front of the pocket and I�m not required to do anything special with the cue ball for position on the next shot. The most common situations are when you have a short shot and you have to draw back to the opposite end of the table for position, but the shot forces you to reach farther than you�d like. I teach players to start with the closed bridge as opposed to an open hand bridge because it can be hard at first to keep the cue from coming off the top of your hand when using an open hand bridge. The closed hand bridge really helps your confidence at the start because your finger has to come all the way undone for the shaft to come up off of your hand. It gives you more control. Try the shot in the diagram. First shoot the shot that allows you to use your dominant side. 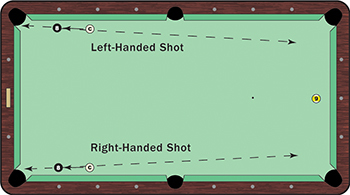 You�ll notice the same shot on the other side of the table is a much more difficult reach and is much easier to shoot if you can use your opposite hand. When you are just starting with the opposite hand, spend a good half-hour a day shooting shots that you can�t easily reach with your dominant hand. The more you do it, the more you put it into muscle memory.